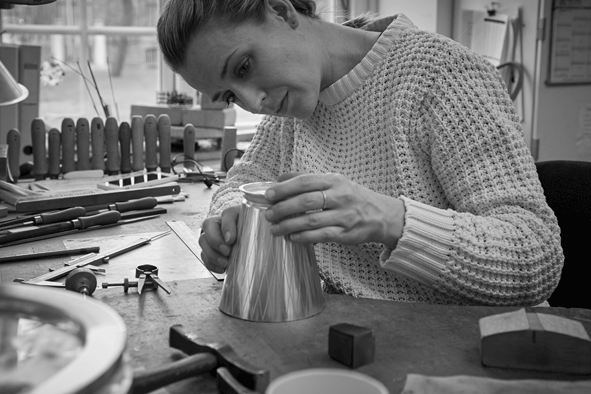 Tina Bentzen, silversmith at Georg Jensen for more than 10 years, has worked on the development and creation of the Kengo Kuma tea set and most recently, the Bernadotte Collection. Georg Jensen is a Danish design house renowned for artistic boldness, superior craftsmanship and creative collaborations with some of the foremost designers of the past century – and today. Founded in 1904 by master silversmith Georg Jensen, its collections include silverware and flatware, fine jewellery, watches, accessories and a home collection. Georg Jensen now has over 100 points of sale worldwide. Tina will be demonstrating at the V&A Museum with Contemporary British Silversmiths on the 5th May in the Silver Galleries as part of Silver Speaks. She will be demonstrating the earned skills required to create the unique pieces from the Bernadotte bar collection.